They’re everywhere. Front and center in the gym, you have to walk past row after row of these bulky, single-purpose pieces of equipment to get to the free weights. We’re talking, of course, about treadmills. Treadmills are tricky things. Some people love them, a great gateway drug into the world of health and fitness. 0.2 What is a Manual Treadmill? To others, they’re the scourge of the industry, and have made a solemn pact with themselves never to touch one. Now, when you see all of those treadmills lined up neatly on the linoleum in your neighborhood gym, you’re likely seeing the motorized version. You set your incline, set your pace, press a few buttons and you’re off to the races. But have you ever heard of a manual treadmill? Oh yes, they’re real. And manual treadmills just might change the way you think about treadmills forever. In this article, we’ll go over what manual treadmills are, the benefits of owning your own, how to use one correctly, the differences between manual and electric treadmills, things to consider before buying, and potential disadvantages. We’ll also be covering the top available manual treadmills on the market today, so you can have a better sense of what you’re getting with your new favorite – or new least favorite – exercise machine. Let’s get into some manual treadmill action! Good question. Manual treadmills are belts that are powered by your very own feet. When you get on the treadmill, you have to push with your feet to get the belt moving. Once you’ve given it enough momentum, you control the speed by going faster or slower. If this sounds like an early-on version of the traditional electric treadmill, you may be right: Having to push-start your treadmill seems a tad archaic. But, as we’ll see, using a manual treadmill over an electric one does have its advantages, as well as its disadvantages. By weighing the pros and cons of each piece of equipment, you can decide for yourself which one works best for your fitness goals. Cost: When it comes to at-home exercise equipment, everything costs an arm and a leg. However, with a manual treadmill, you can get a fantastic workout in with a small investment of under $100. Spread that to the lifespan of the machine, which should be years, and you’ve got a cheap alternative to something that can cost much, much more. 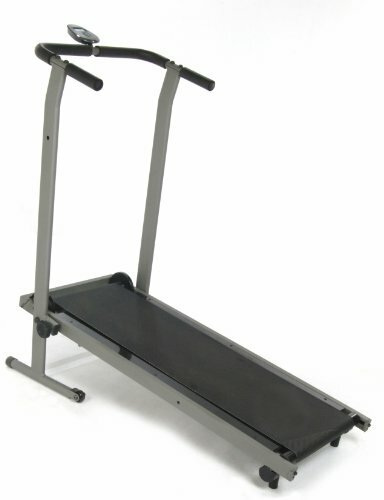 Lightweight/Easy to store: Another beautiful thing about manual treadmills is they are very low maintenance. You can fold them into compact items you can store easily. Plus, without weighty electric machinery it isn’t too bulky. Can be set up anywhere: No need for an electrical outlet, extension cords, or anything like that. Manual treadmills are durable and freestanding, meaning you can put them in your yard, your family room, the deck…basically, your imagination can run wild! Simple but effective: The lack of bells and whistles may make it seem like you’re getting short-changed, but that is the beauty of a manual treadmill. It’s simplicity allows you to eliminate variables that you find with other workout equipment. It’s just you, a belt, and your own momentum. What could be any more natural? The closest thing to running through your neighborhood without having to leave the comfort of your home. That’s what you get with a manual treadmill. These benefits are vital for some of you who don’t appreciate the loud, crowded gyms or live in a place with terrible weather conditions. Work out in your own zone with a manual treadmill, and your body will thank you. The biggest thing with a manual treadmill is proper application. When used properly, a manual treadmill gives you all of those benefits listed above. But you have to use it properly. Adjust the incline to manufacturer’s preferences. Also make sure it’s sturdy enough for the weight it’s going to bear. Step onto the belt and walk slowly. By starting slowly, you won’t fly off the end. In order to get movement, step forward and push back along the belt. Alter speeds when accelerating or stopping by gradually speeding up or slowing down your feet. Only use the handles when you’re slowing down to stop; otherwise, you’re taking away from the entire point of a manual treadmill. While it might make sense to use a motorized treadmill to lose weight effectively, a manual treadmill is also wonderful for shedding pounds. The trick is to run in the incline position. Then, you gradually increase the speed to the optimal pace for weight loss. That is, the fastest you can run on the treadmill without losing control and a pace you can control for a couple of minutes. It would be tough to do a quick HIIT workout with the manual treadmill because it takes a while to decrease the speed. Therefore, you can ramp up to your optimal speed, then use the handles to get off the treadmill and go do other exercises while the treadmill slows down. For example, slowly ramp up to optimal speed, stay there for 1-2 minutes, then jump off the treadmill using the handles and do some burpees, push-ups, pull-ups, and squats. Once the treadmill is slowed down, get back on and do it all over again! Do this workout for around half an hour, three times a week. If you can maintain this exercise routine consistently, you should be able to see some weight loss improvements. The great thing about manual treadmills is that you can go as fast as you want. Therefore, even if you aren’t good at running yet, you can learn with this piece of machinery. Spending a few weeks with a manual treadmill should allow you to up your running game. However, you can only go so fast with a manual treadmill before it goes out of control. If speed is what you’re after, it’s best to test your skills on a track. But, if you want to go for endurance, then you can continue to increase your time on the manual treadmill. Some manual treadmills don’t have the equipment for it to go fast, so make sure you test out and get the correct manual treadmill for running purposes. While the manual treadmill has its perks, its big brother, the electric treadmill, also has its benefits. Both are great at increasing your overall health – especially cardiovascular – but their differences are enough that you can make a solid decision on which one is ideal for your goals. First off (not to sound condescending), a manual treadmill doesn’t have a motor, while an electric one does. Duh. However, this means you can do a lot of various things with an electric treadmill, such as differing inclines, set paces, HIIT workouts, hills, and more. The biggest differentiating factor for the manual treadmill is its simplicity. Sometimes, you need a machine that just lets you run at your natural pace and that’s it. 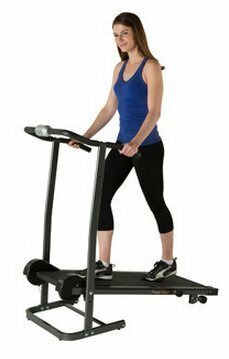 Plus, with less equipment, the manual treadmill is light, compact, versatile, and can be placed anywhere to get a workout in. With an electric treadmill, you can get a great workout too, but once you set up the machine you kind of have to keep it there. It isn’t a real mobile piece, and it’s weighty. Yet, if you get the right brand of electric treadmill, it should be able to track your progress on certain presets. Our recommendation is, if you’re looking for overall health improvement for a value or you’re looking to build up your endurance, a manual treadmill is best. You only need an electric treadmill if you want the machine to track specific trails and get fancy with your incline. Also, to set speeds and get great HIIT workouts, an electric treadmill is better than a manual. Excess strain: Because you have to essentially kickstart your manual treadmill, you’ll experience more strain on your legs and lower back to get things going. This increases your chances of injury if you don’t warm-up properly and start running gradually. But, if you do these things correctly, that additional strain is actually beneficial for your fitness and strength. Tough to get enough momentum: For those who want to run full-bore, manual treadmills aren’t the best. Jogging and fast-paced walking are ideal for a manual treadmill, and even some decent jogging. But if you want to get up near your max potential for running, a manual version of the treadmill might not be a good idea. Despite these disadvantages, they can actually be seen as good things to certain athletes. The fact that a manual treadmill is basic might be exactly what a midrange runner is looking for. Or, for the athlete who wants to work on their leg control and power, a manual treadmill is the way to go. The one question you have to ask yourself is this: Do the pros outweigh the cons? Weight Rating: You’ll need to grab a treadmill that can handle your weight and momentum. Lower-end treadmills usually have a weight capacity of 200-300 pounds, while high-end treadmills have a limit between 300 and 500 pounds. Just be sure the treadmill can handle whoever is going to get on the machine. Footprint/Belt Size: This is important because this is where you take your stride into consideration. Depending on how big you step – especially when you run – will determine how long you need your manual treadmill to be. For most people, you’ll want a footprint of at least 60 inches. Price: Of course, because these treadmills don’t have fancy motors or anything like that, you’ll want a good deal. Like we said before, these machines should be cost-friendly and around the low triple figures. You should find a great manual treadmill for less than $200. Warranty: Now, just because they’re not too spendy, that doesn’t mean you shouldn’t get a warranty for your manual treadmill. No matter the brand, you make sure that you grab a solid warranty for a handful of years. With such an interesting, rough machine, keeping your investment safe is a smart call. If you can keep all of these in front of you, you can find a tremendous manual treadmill brand. First up on our list is from the bros over at Paradigm Health and Wellness, Inc. Their Fitness Reality TR1000 Manual Treadmill is small, sweet, and to the point. This product has a little bit of everything, adding some bells and whistles to a tight, compact piece of equipment. It has two levels of incline, twin flywheels, and easily storable. You can also get expert assembly for an extra fee (though you don’t have to get this). With sturdy handlebars, an okay-sized footprint, and differing levels of incline, you can get acclimated to running with precision and power. For an easy, straight-to-the-point manual treadmill, it’s hard not to go with the Fitness Reality TR1000. Next is a magnetic manual treadmill from Confidence Fitness. This one’s a little more quality with a sturdy foundation. This machine also gives you the option for expert assembly with an additional charge, but it isn’t necessary. Magnetic resistance gives you 8 adjustable levels, and suitable for up to 220 pounds. Not only that, but it has a 12-month warranty with an almost 50-inch footprint. Plus, it actually includes a multi-function computer that equates your speed, distance, odometer, calories, time, and other functions. And with a simple lock-pin mechanism and wheels, storage is a sinch. For what could be the most comprehensive of our manual treadmills, the Confidence Fitness Magnetic Manual Treadmill gives a lot of bang for a little buck. EFITMENT is a solid fitness company with an amazing machine in their adjustable incline magnetic manual treadmill. This one again gives you a few tricks up its sleeve. If you want expert assembly, you can get it (with a fee, of course). 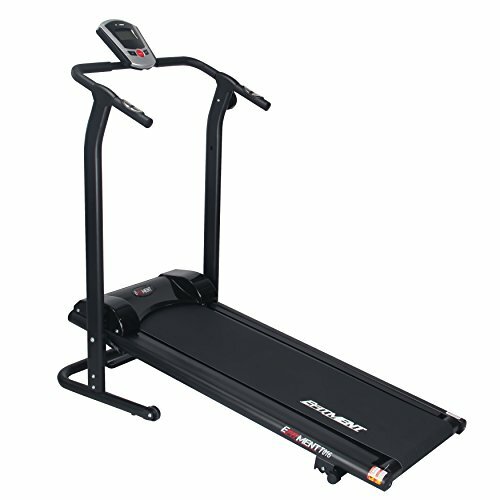 It has an adjustable incline – at seven, eight, and nine degrees – a jogging surface of 42 inches, and a quick and easy setup/ breakdown. On top of that, there’s an LCD console on the handlebars that records speed, time, distance, calories, and odometer. It repeatedly scans the user’s metrics; every four seconds, you get the next statistic, allowing you to read your data hands-free. If you’re looking for something that’s easy to set up, workout, record, and put away, look no further than the adjustable incline treadmill from EFITMENT. Lastly, Stamina brings us an incredible treadmill with InMotion. Another option for manual assembly, and yet another great choice for a manual treadmill. 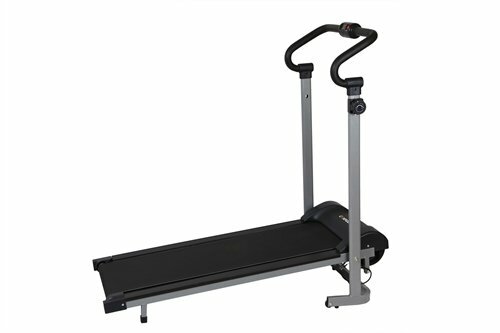 This treadmill specifically includes two varying inclines – eight and ten degrees – and a one-year frame warranty. (The parts have a 90-day warranty). The jogging surface has a textured, non-slip material, along with a foam pad front and side rails. It has folding steel frames with wheels for easy mobility and storage. Also, the electronic monitor (ran on battery) checks out your time, speed, distance, calories burned, and other scans, similar to previous treadmills in this list. A sturdy, solid, standalone piece of equipment, Stamina’s InMotion is an easy-to-use, easy-to-move, simple workout…all in one. Manual treadmills are a great tool that nobody talks about. And yet, it has so many advantages that it’s worth taking a look at. Cheap, durable, simple, and mobile, manual treadmills are worth the investment. Your leg strength and your cardiovascular health will be miles above where you began. Hopefully, now you know how to work a manual treadmill, how to progress, and the benefits and disadvantages of a manual treadmill. They’re worth checking out; research which treadmill works best for your routine and go for a jog wherever, whenever.